Donuts, Donuts, and more Donuts! When it comes to sweet decadence, you can never get enough. Donuts are the perfect super food for any occasion; and now you can enjoy them as a keychain series. Take them everywhere and add a little color and funky sweetness to your life with 16 different delectable characters. 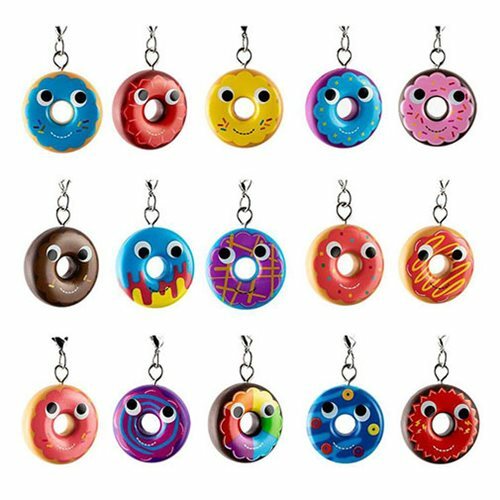 This Yummy World Attack of the Donuts Series Key Chain Display Tray has key chains in a wide array of colors and patterns, guaranteed to level-up your accessory game. Ready or not, here comes the Attack of the Donuts! Please note: Item selection is random. We cannot accept requests for specific items, nor can we accept returns on opened items. You may receive duplicates. Ages 3 and up.